Please note that this current website does not have a shopping cart. 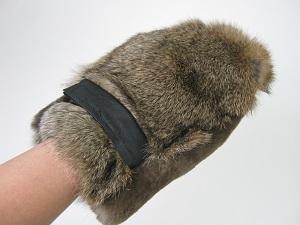 To buy our gallery Beaver Massage Mitts online, please go to our e-commerce website at NaturalExotics.ca. 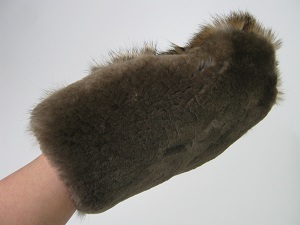 Give your loved one a luxurious massage treatment this Valentine's with this fur massage mitt! 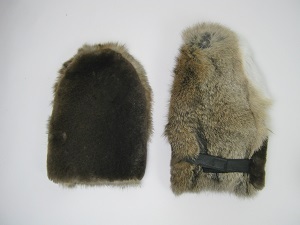 Handmade with care from real fur skins, the top is made from soft Czech rabbit fur, and the palm side is made from plush sheared beaver fur. The massage mitt comes with a black leather velcro closure that allows you to tighten the mitt. Available in two sizes: Small and Large. The mitts are machine sewn, unlined and have no thumbs. Genus and species for Beaver: Castor canadensis. Wild. Genus and species for Czech Rabbit: Oryctolagus cuniculus. Ranch. Beavers and Rabbits are not endangered and are not subject to CITES controls.